When a force is applied to a structure, the length of the structure changes. Strain is the ratio of this change in dimension to the original, and strain gauges are used to measure it. As the strain gauge is glued to the structure, any distortion will also cause a distortion of the strain gauge. The gauge contains conducting material and the distortion therefore results in a change in its resistance. By measuring this change in resistance we can measure the strain. The change in resistance is measured through a Wheatstone bridge arrangement. This has 4 arms, arranged in a square. Each arm contains either a resistor of known resistance, or a strain gauge - strain gauges will occupy 1, 2 or 4 of the arms. Taking the case of 1 strain gauge in the Wheatstone bridge - a quarter bridge arrangement. Power lines are connected to opposite corners of the bridge, lets call them A and C, providing an excitation voltage. The measurement is made across the other corners - B and D - of the bridge. If the resistance of the strain gauge changes, the current across the bridge will change (according to Ohms law, V=IR). If we measure this change we gain a measure of the strain. With computerised strain gauge measurement systems, such as our 751-SG package, the change in voltage across the bridge is usually measured, rather than the current. This of course assumes nothing else beside a dimensional change is causing the resistance to alter (temperature for example) and that the excitation voltage remains constant. Computerised systems can automatically compensate for such potential error sources. In some applications, the sensitivity of the system can be increased by using "half" or "full" bridges. For example, imagine a tube sticking out of a wall. A downward force is applied to the end of the tube, compressing its underside and stretching (tensioning) its upperside. The compressive and tensile strain measurements are equal. Using a strain gauge on either side (a half bridge) increases the sensitivity of the measurement, and automatically compensates for changes due to temperature. Similarly, mounting two gauges in compression and two in tension makes a full bridge which again increases the sensitivity. A computerised system measures the bridge output voltage before the strain is applied, and then at regular intervals or whenever certain conditions apply. As you need to measure the voltage across the bridge, you need two leads for each measurement. Your data acquisition interface should therefore accept differential inputs. You need to apply an excitation voltage to the bridge. Some hardware provides this excitation, but is limited in the number of strain gauges it can handle. Other hardware needs an external power supply, but will distribute the excitation voltage to many more strain gauges. We're assuming that the measured change in voltage is only due to the change in strain. However, other factors might also affect the reading, such as a change in the excitation voltage. This is of especial concern in long-term measurements where component values may drift with time and temperature. However, with suitable hardware and software like Windmill, a computerised system can measure the excitation at any time and then adjust the strain results for changes in the excitation voltage. The changes in voltage due to strain are tiny: measured in microvolts. Monitoring such small signal changes can often produce jitter in the readings from noise. For slow sampling you can counteract this with an integrating analogue-to-digital converter. By averaging the signal over 50 or 60 Hz the noise is rejected. If your system is not capable of zeroing gauges, ensure that your analogue-to-digital converter has high enough resolution to give the dynamic signal range required. Even if you can zero the gauges, in some applications a high resolution converter might still be needed (16- or 18-bit for example). For high speed sampling of strain, it's useful if your data acquisition hardware has RAM storage of gain (range) and balance voltage for each bridge. When using quarter bridges (1 strain gauge) or half bridges (2 strain gauges) your hardware will typically provide high quality termination resistors. This makes it easy to permanently wire your signals to the hardware. 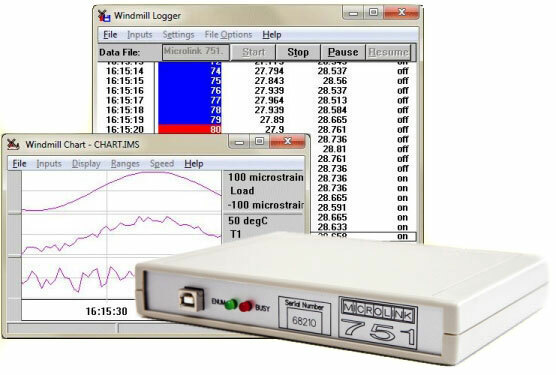 We recommend the Windmill 751-SG package to measure strain. This 751-SG comprises our Windmill data acquisition and control software together with a USB measurement unit and boxed strain gauge inputs card: a flexible, easy-to-use yet powerful system for just £475. For Ethernet and TCP/IP networks we recommend the Windmill 851. You can connect up to eight units to one PC via USB, allowing 128 strain gauges to be monitored. For more strain gauges consider the our 851 units - an unlimited number of which can be connected to an Ethernet network. Strain gauges need an external excitation voltage to supply sufficient current to keep all the bridge circuits energised. The 751-SG package provides four sets of 16 screw terminals giving + and - excitation and signals for each of 16 bridges. Two 1 kOhm termination resistors are mounted in half bridge configuration whilst high quality 350 and 120 Ohm resistors can be provided for the completion of quarter bridges. The auxiliary channel of the 751 USB unit is used to monitor the excitation voltage. The analogue-to-digital converter on the 751 can directly measure voltage imbalance. When a bridge input is selected the Windmill software automatically monitors excitation voltage and performs the bridge calculation to produce a reading in microstrain. This eliminates errors due to changes in excitation voltage (see point 3 above). You can also set a zero reference level (point 5 above) and monitor changes relative to that level. With the Windmill Strain Measurement package you can configure individual channels to accept any one of the following inputs. Alternatively fill in this form or contact Windmill Software at the address below.